Work done to a 1933 Austin 10/4 by John Goodall & Co., Dunfermline. Homepage. 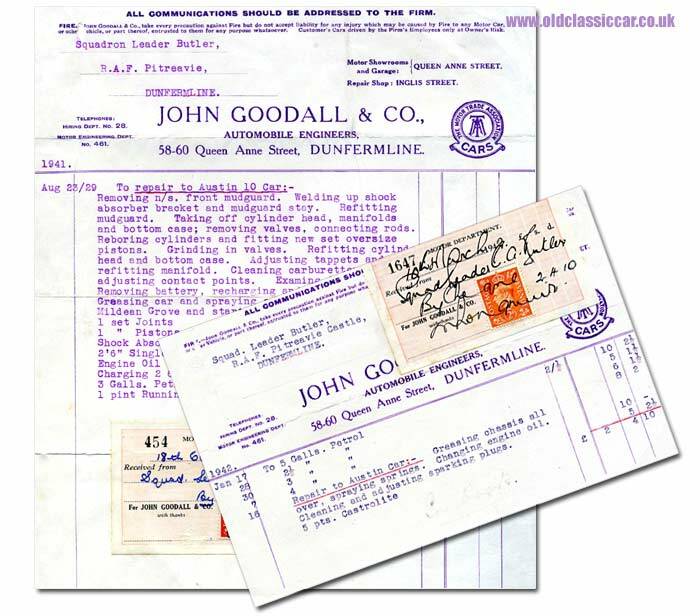 This page: Invoices for repairs made to a 1933 Austin 10 by a garage in Dunfermline, Scotland. John Goodall & Co. Automobile Engineers, Dunfermline. A number of papers once the property of RAF Squadron Leader C.A. Butler now get a mention on the site, relating to a pair of Austin 10s that he owned in the late 1930s, and 1940s. There is, for example, an invoice raised by Central Motors Ltd for some servicing work undertaken on his 10/4 in 1938. At that time he was based at RAF Leuchars, but in 1941 - the date of the earliest of the two invoices featured on this page - he was stationed at RAF Pitreavie Castle, in Dunfermline, the town which was also the location of this motor engineering workshop. John Goodall & Co. were situated at 58-60 Queen Anne Street. In fact the Queen Street address was for their main motor showrooms and garage, with another building (the repair shop) apparently located on Inglis Street. Other than being an approved member of The Motor Trade Association, there is little other information offered about the services that were offered. Some fishing around online brings up mention of advertisements for Swift cars in the 1920s, so perhaps they held a franchise for this marque at the time. For which the princely sum of £13 11s 5.5d was required. A second invoice, dating to 1942, itemises petrol sales to Squadron Leader Butler during the month of January, plus another service, and a fresh sump's worth of Castrolite oil. I'm assuming that travelling in the line of duty required the use of petrol, made available to "essential users" only at that time.